Peel the plantain and cut it into 1-inch slices. Heat the oil over medium heat and fry the plantains on both sides until the turn yellow (not golden brown). Transfer to a plate covered in paper towels to absorb the excess oil. Flatten each plantain with the help of the base of a cup until it's completely flat, but without breaking it. Should be about 1/2 inch high (or a little less). Grease 6-8 muffin moulds with oil and place one slice of fried, flattened plantain in each mold. Use your hands to create a basket in the mold with the plantain; it doesn't need to be very high on the side. If one slice is too small or breaks, simple use a piece from another plantain to complete the basket. Bake for 20 minutes, remove from the oven and let cool completely (at least 1 hour). This way you'll avoid having any of them break when you remove them from the mould. When the baskets are cool and have been carefully removed from the mould with the help of a knife, prepare the coleslaw by mixing the cabbage, onion, carrots, tomato, oregano, salt, pepper, olive oil and lemon in a large bowl. Heat the fried beans in a saucepan and serve in each plantain basket with a tablespoon of slaw on top. The beans can purchased ready or can be easily sautéed in oil or onions and blended until creamy. Another tasty idea for these baskets is sprinkling them with cheese instead of salad and letting them broil for a few minutes until the cheese bubbles and browns. In this case the coleslaw would be served as a side. One of Nicaragua's most famous dishes is fried beans with coleslaw and tostones. Sounds simple, but you have to experiment to understand how delicious this combination really is. There are few things better than this. I know this simple food really well because my mother's family is from Nicaragua and I grew up eating this dish. Though it might seem like a relatively simple daily dish, it was always a big deal in my house and our mouths would water just waiting to be served. 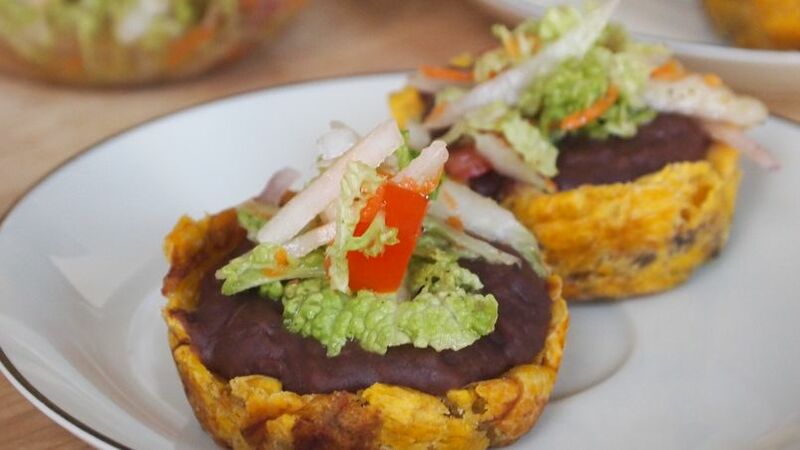 Thinking about this, it occurred to me that this combination of beans, tostones and salad would be perfect for any social even with friends or family, since everyone seems to love these tasty ingredients. So I decided to make these little canapés using these ingredients and the results were delicious!